It’s hard for me to imagine situations where Apple’s current range of iPads are considered too large. 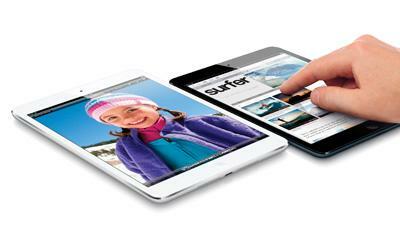 The iPad Mini was launched in November to fit the demands of those who could. True to its name, the Mini is also smaller and thinner than its predecessors — making it easier to hold in one hand than previous generations. Compared to the heft of the iPad 3, the 308g Mini is practically feather-light — in fact it’s less than half the weight. The Mini’s killer feature seems to be this size advantage — it can now fit in small handbags, camera bags, and pockets. Much like the Nexus 7 and Kindle Fire, this smaller form-factor makes it better suited as a reading device. If you’ve tried reading ebooks on a 10-inch tablet with one hand you’ll appreciate this move. Although cheaper and lighter than its larger counterparts, the Mini maintains the same high quality industrial design. Its aluminium unibody back and front glass panel have been fitted together with the same level of craftmanship as previous generations of the iPad. The iPad Mini uses Apple’s new connector port, which is the smaller, reversible ‘lightning cable’. This works just as well, if not better, than the previous 30-pin connector - but the cables aren’t as ubiquitious as the older type so if you forget your cable you can’t always trust there will be someone in the office with a spare. The Mini has a 5 megapixel main camera, and a 1.2 megapixel front facing camera for Facetime. The 7.9-inch display has a resolution of 768 by 1024 pixels. Although I’ve been comparing it with devices like the Nexus 7 and Kindle Fire, Apple’s entry into the field gives you almost one extra inch of diagonal screen real estate. The quality of the images on the Mini’s screen is comparable to the iPad 2. It’s bright, has good colour parity, but isn’t amazing. If you’ve become used to the high pixel densities of the iPad 3 or the latest iPhones, the pixels on the Mini will look almost stoneage. The bezels along the left and right side of the screen in portrait mode are only around 1cm thick. Apple has added palm detection software to the iPad Mini iOS builds which negates unwanted touches. Apple has more than one million apps in its App Store, this depth of software is what makes its devices such an easy sell. There’s an app for everyone, and it’s still something that Microsoft, and even Google, haven’t been able to beat yet. The iPad Mini can take advantage of a large swathe of those apps. It has the same resolution as the iPad 2, and any iPad app can be used on the Mini. This is in stark contrast to the disparity in Android, where developers need to build their apps specifically for the 7-inch tablet format to work on devices like the Kindle Fire and Nexus 7. The Mini uses Apple’s A5 processor, which is dual core and clocked to 1 GHz. I wasn’t able to notice any discernable difference in performance between the Mini and an iPad 2, but when using more intensive apps like iPhoto, there are very small lags while performing tasks. Apple says the iPad Mini has a 10-hour battery life, and that’s pretty much what I got after a full charge. I used the Mini as my main device over four days. In that time I browsed the internet, watched YouTube videos, sent and recieved Tweets, and sync’d with my email regularly. I also spent a significant amount of time editing RAW photos with the iPhoto app. Each full charge would usually last a full day and most of the next morning. Watching longer online videos significantly cuts this figure to around 6 hours, but I was very impressed with the longevity of the battery. The Mini isn’t a tablet I’m likely to purchase (unless I have a really sad moment of envious consumerism) - the screen size is just not right for me, and the lower pixel density is just too noticeable after six months of using the fantastic iPad 3. However, after using it for a week I can see where it fits into the form factor ecosystem - for the readers, commuters, children, and people who need to pack extra light (and don’t already own an iPad) this is a great tablet.